Arrive in Delhi. Reception at the airport and transfer to hotel. Overnight at hotel. In the morning panoramic tour of the city. Delhi, the capital of India is a city with a fascinating history and dynamic present. First, Old Delhi, the ancient city of the Mughal sultans steep streets teeming with people and New Delhi, the capital of the Indian with wide tree-lined avenues designed and built as a garden city. Visit Jama Masjid, the largest mosque in the country built in 1644 by Emperor Shah Jahan and the bustling shopping centre of Chandi Chowk to 1,001 stalls. Between Chandi Chowk bazaar and the Yamuna river, visit the Red Fort which was once the most opulent fort and palace of the Mughal empire. Then, New Delhi, aristocratic residential part of the city with administrative and government buildings. The Rashtrapati Bhawan, the presidential palace, parliament and India Gate. Raj Ghat where Mahatma Gandhi was cremeated. Connaught Place, the "connected" Delhi with its shops, restaurants and nightclubs instead. In the afternoon, transfer to Delhi airport and flight to Udaipur. Overnight at hotel. Tour of the White City, the most romantic city in Rajasthan, which is a beautiful sight with its marble palace on the edge of the lake, its islands and surrounding hills. Founded in 1559 by Maharaja Udai Singh II, it follows a plan perfectly mastered of defense and beauty. Visit the City Palace and Museum. Continue to Jagdish Temple, Lake Fatehsagar and Sahelion Ki Bari visit, the garden of the bridesmaids of the Maharani, a large ornate flower beds, fountains and kiosks of marble in the garden. In the late afternoon boat ride on Lake Pichola where you can admire the magnificence of the royal palace and the city. Overnight at hotel. Morning drive to the 108 temples of Eklingji still active. Many pilgrims come to their devotion to the god Shiva, a great place to enjoy the fervor of believers who wash the statue of the god before covering lei. Then on to Nagda, ancient capital defunct kingdom of Mewar. Nagda is still famous for the ruins of three magnificent Jain temples exquisitely carved lost in a magical setting. Continue to Deogarh. On arrival transfer to hotel. A stroll through the village from another time to meet the indigenous is more enjoyable. Overnight at hotel. After breakfast drive to Ranakpur, one of the most beautiful sanctuaries Jains. Visit the most amazing site, both for the quality of its carved decorations, the complexity of the architecture of its temples, that the charm of the place. The main temple is as big as a cathedral and interior sculptures reminiscent of fine lace. Continue to Jojawar. In the afternoon train ride through the beautiful landscape of Rajasthan. The route follows tunnels and bridges between the Aravalli Hills, overlooking the majestic lake and along the surrounding forests. Then jeep safari to meet the local ethnic groups where you can learn about their customs and their way of life. Overnight at hotel. Early departure for Jaisalmer. Upon arrival, explore the fascinating medieval town of yellow sandstone, lost in the desert of Thar. Built on a hill allowing it to monitor the horizon for miles around, this ancient caravan step, however, is surrounded by a rampart of five kilometers with a hundred bastions. Inside the fort, a maze of courtyards and buildings with ornate balconies, the rooms covered with blue faience and a terrace that offers a spectacular view of the city and the walls. 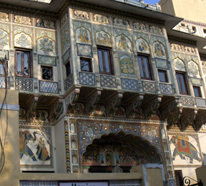 Stroll through the old town and visit the magnificent Patwon-Ki Haveli, former home of the brocade merchants. Then Gadisar excursion to Lake, a lake of rainwater conservation of the 14th century. It was at the time, the main source of drinking water for the entire city. Overnight at hotel. Morning drive to Khimsar, a former 16th century fort built at the edge of the Thar Desert. Built for military reasons, it became a royal residence two centuries later when the Thakur of the time settled there with his family. Today, the fort is partially occupied by the descendants of Thakur and the other has been converted into a hotel. By late afternoon, jeep ride around to explore the fauna and flora. Overnight at hotel. Departure by road to Bikaner. 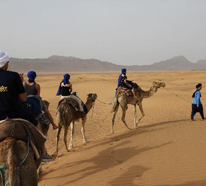 Visit this desert city crossed by caravans from the Far East and Arabia, which today is known for its camel farms considered to be part of the best camels in the world. Camel Research Farm is a leader in medical and genetic research. Visit the fort of Bikaner and the old palace. Junagarh Fort in the 16th century features beautifully decorated palaces and temples of red and yellow sandstone. Inside, there is a museum dedicated to arms that surprises with the excellent state of conservation of jewelry. Overnight at hotel. Starting Jaipur, stop at the Temple of Rats Deshnoke. It houses hundreds of rodents revered evolving freely in the temple and are hardly offensive. A cook is their particular dedicated and ensures their good health. Continue to Jaipur and enjoy the beautiful scenery during the ride and crossing the villages of the region. The city is renowned for the manufacture of carpets in silk and is also the city of gems. Many major international jewelers and recognize the professionalism of its tailors and especially the quality of its stones. Arrive Jaipur and transfer to hotel. Overnight at hotel. 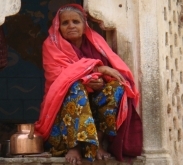 Full day visit to the capital of Rajasthan. Jaipur, built in 1727 by Maharaja Sawai Jai Singh II, is known as the "Pink City" because of the color of its walls. Morning visit the Amber Fort situated a few kilometers from the city. Amber was the capital of Rajasthan before being dethroned in 1728 by Jaipur This former fortress built atop a rocky outcrop, is available on elephant back or jeep. In the afternoon, visit the City Palace, the royal palace combines Mughal and Rajasthani architecture and sumptuous museum containing many treasures. Then, in front, visit the Observatory, Jantar Mantar Observatory, built in 1700, still regarded as rather futuristic. End of the visit, stop in front of the legendary Palace of Winds, Hawa Mahal, with multiple openings. It was built for the women of the royal families so they can attend the processions without being seen. Overnight at hotel. Depart for Agra and en route stop at Fatehpur Sikri, the red sandstone ephemeral capital built by Emperor Akbar to commemorate the long-awaited birth of his son. It was completed in 1574 but the city was abandoned 15 years later due to lack of water. It was a city "fairy tale" and remains in perfect condition, witness the splendor of the imperial court of the time. Continue to Agra. Arrival at the hotel. In the afternoon, visit the Red Fort of Agra which is the largest fort in India declared cultural heritage of UNESCO since 1983 Mentioned for the first time in 1080, it was only in a simpler time red brick fort. In 1558, Emperor Akbar decided to Agra his capital and rebuilt in order to make it a residential palace fort. Overnight at hotel. At sunrise visit Taj Mahal, the majestic white marble mausoleum that stands at the bottom of a huge garden on the edge of the river Yamuna. The Emperor Shah Jahan, mad with grief at the death of his beloved in 1653, made him build this tomb which was completed after 23 years of titanic work. An architectural gem, it is a symbol of perfection rarely equaled huge and crazy love of an emperor for his wife. It is inside the Taj Mahal, in an underground crypt, they both rest for eternity. In the afternoon, return to Delhi and evening transfer to the international airport for the flight home. A nice hotel with impeccable pool in an authentic little frequented tourist village. Nice reception. The hotel offers a variety of activities including horseback rides and picturesque train. A quiet and peaceful country. Magnificent building service and superb hospitality. The rooms are very elegant and tastefully decorated. A great pool in the garden. The view from the ramparts is magical.